Region blocked in certain countries. Region-Lock on Steam, some users from Latin American countries cannot view or purchase the game (country exceptions: Chile). The files in %LOCALAPPDATA%\Microsoft\XLive contain your unique offline profile ID. Bezel-compensated resolutions are not supported. 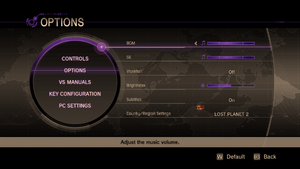 Main menus are pillarboxed. HUD elements remain in 16:9 resolution positions. Up to 16xQ CSAA in DirectX 9 mode, and up to 32x CSAA in DirectX 11. Download, install and run Cheat Engine. Run the game and start a map. 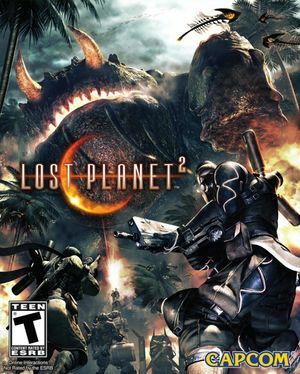 Add the Lost Planet 2 process to Cheat Engine. Scan for a float value of 45. Go back to game, zoom in with any standard weapon, then go back to Cheat Engine and scan for a float value of 28. The third found address controls the default view FOV (when not zooming in). Add it to address list and set a hotkey to change the value while in game. Usually the address will change when a new area is loaded, so the scans will have to be repeated. Game will reset to original FOV value when zooming in, entering and exiting a VS, sprinting and dying, so using a hotkey is recommended. The FOV will "jump" to lower value when looking high up if the FOV value is above 60, it will also "jump" when looking down if FOV value is above 52. To avoid this use a maximum value of 52 while on foot and 40 when inside a VS. This will not have effect when inside stationary VS or helicopter. Open <path-to-game>\dxgi.ini or %USERPROFILE%\Documents\My Mods\SpecialK\Profiles\LP2DX11.exe\SpecialK.ini depending on the installation method you used. DirectX 9 version uses <path-to-game>\d3d9.ini or \LP2DX9.exe\SpecialK.ini. Set Borderless=true and Fullscreen=true under [Window.System]. Set OverrideRes=0x0 to the resolution of your screen (e.g. OverrideRes=1920x1080). Can bind two actions to one key despite interface notices; results may vary based on combination. Cannot bind thumb mouse buttons. 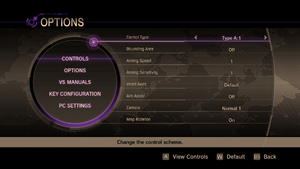 Enabled by default; to disable it go to in-game Options, Key configuration, Controls, and set the "Mouse Sensitivity" setting to max value (32). This can be caused by the MS13-057/KB2803821 update (Windows RT, Windows 8, Windows 8 Enterprise); reinstall the update to resolve the issue. Vista and later: Open the Start screen/Start menu, type appwiz.cpl and press ↵ Enter. Windows XP: Press ⊞ Win+R, type appwiz.cpl and press ↵ Enter. Vista and later: choose View installed updates. Windows XP: choose Show updates. Locate KB2803821 and remove it. Run Windows Update and install the update again to get a newer version that does not have this problem. Lost Planet 2 does not support more than 6 cores. Disabling cores will allow the game run normally. 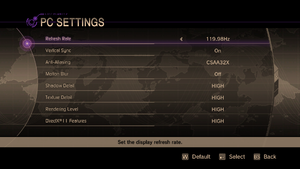 Fullscreen mode defaults to 60 Hz on startup, even if it's been changed on the previous launch. ↑ Games for Windows - LIVE DRM features: SSA+ZDPP activation, supports local profiles. ↑ 2.0 2.1 File/folder structure within this directory reflects the path(s) listed for Windows and/or Steam game data (use Wine regedit to access Windows registry paths). Games with Steam Cloud support may store data in ~/.steam/steam/userdata/<user-id>/45750/ in addition to or instead of this directory. The app ID (45750) may differ in some cases. Treat backslashes as forward slashes. See the glossary page for details. This page was last edited on 7 April 2019, at 17:48.